Above, Elise makes the most of the dahlias that flopped. You can always click the Food For Thought tab above for my fresh-picked links. How to stockpile @ Momadvice & Pantry stocking strategies @ Coffee Tea Books & Me. July kicks off No Spend Month @ Small Notebook. If you're tired of couponing, Money Saving Mom says it's okay to take a vacation. Y'all will be proud of me. Ever since the pantry problem, I've been crossing off projects left and right. Check back Monday for photos! I can't wait to see the finished projects. I'm going to be busy this weekend, too, but I'm trying to get things done without interrupting hubby's long restful weekend! He needs a break! Have a wonderful (productive!) weekend! I'm taking a vacation from the coupon game this summer. I was getting weary just thinking about it... and with two little boys impatiently hanging off the grocery cart while I shop, well, let's just say that these days I'm breezing into and out of the grocery store as quickly as I can. A Vacation, What is that? Seems like years since I had one... I'll be back to see all you've accomplished. 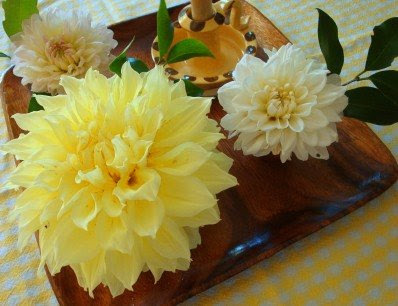 These pictures bring back memories--my mother grew large dahlias like these, and called them "dinnerplate dahlias". She would cut the stem short, and float them in a bowl of water in the bathroom. They were just beautiful! You continue to inspire me. Right this moment I'm taking a break from cleaning/organizing the basement. I'm sure you will share some great pics with us. Elise's little hand looks like the teapot illustration in Eloise Wilkin's Little Golden Book about God from the 1960s! I remember "dinnerplate" dahlias too! Nice memories! Thanks for visiting my blog and for the nice comment about the "homegrown" flowers! Hope you have a very Happy 4th! I'm always inspired when you share what you've checked off your list! We went several months without grocery shopping and using only our pantry. It was a real eye opener as to what works and what doesn't in long term storage. Can hardly wait to see your finished projects. 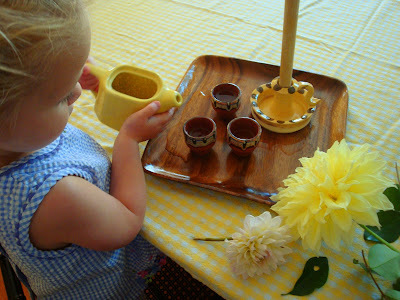 What a precious tea party she is having! I love this picture! Enjoyed your pantry posts as well. Looking forward to tomorrow's project pictures!